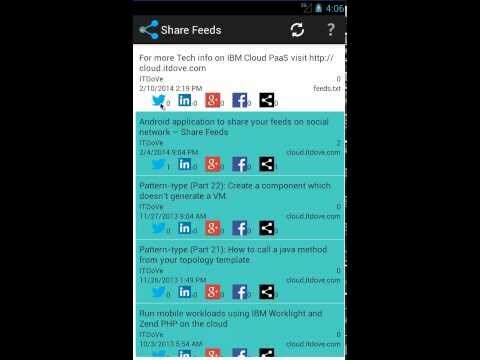 In this post I will describe the application I wrote for Android (called Share Feeds) which allows you to share feeds from registered website with your social network. – Register to RSS/Atom feeds. – Import flat file containing feeds you would like to share. – View the number of time you already shared a feed with your social network. – List all feeds you already shared . – List all feeds you saved for off-line reading . – Save feeds for off-line read. – Export/Import OPML files (Premium only). 1) Setup a list of RSS/Atom feeds you are interested in, you can do it by directly writing the RSS/Aton feed url or by going in to your favorite browser and share the url with this application. 2) Specify the number of feeds you would like to retrieve for each RSS/Atom feed source and setup a prefix and postfix. A prefix could be, for example, if your RSS feed mainly provide videos. A postfix could be an hashtag you would like to insert on each feed before sharing it. 3) In general, each RSS feed comes with categories, the applications allows you to include these categories to the feed your would like to share. 4) You can also specify if you want bitly to shorten the url of the article by providing the Bitly API user and key. If the Bitly credentials are not provided the url will be not shortened. 5) Retrieve the list of articles provided by these URLs and send them to your favorite social network application via the share function or direct link. You can choose to sort the feed by date (reverse order) or shuffle them which can be very useful to randomly send feed to your social network from your favorite RSS feed. 6) Read details of the retrieved article or directly share it. 7) You can share by tapping on any of the icons. If you have an application installed for the network, the application will get opened. 8) You can see the historic of feeds you shared. 9) You can import opml format feeds sources, the import can be done via Dropbox, File Manager,… This format is used by other application such as Feedly. 10) On the Premium version, you can also export the list of feeds sources in an opml format to any file managers such as Dropbox, File Managers…. The application is available at https://play.google.com/store/apps/details?id=com.itdove.sharefeeds.trial for free with ads or at https://play.google.com/store/apps/details?id=com.itdove.sharefeeds for purchase without ads. – Sync the config across user devices. – Sort the feeds based on Author, source, nb total of sent. This entry was posted in Android Application by ITDoVe. Bookmark the permalink.